Residence Inn Omaha Downtown/Old Market Area is among the top hotels in Omaha, NE. Whether you're with us for a few days or a few months, you'll thrive at Residence Inn with the conveniences you need like spacious studios, one- and two-bedroom suites with separate living and sleeping areas and fully equipped kitchens. Enjoy complimentary grocery delivery service and free Wi-Fi. Also indulge in our free hot breakfast served daily and evening social hours Mon-Wed. Keep up with your workout routine in our fitness center. Kids and families will enjoy our GAME ON room equipped with board games, video games, pinball, and more! 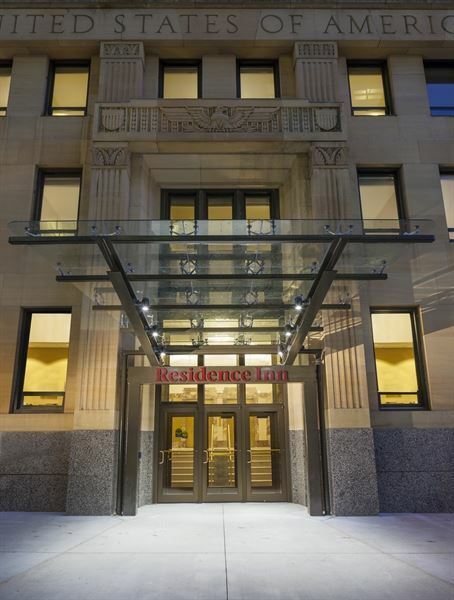 Residence Inn is located in the Financial District of Downtown Omaha, NE offering free shuttle service (upon request) within 3 miles and to/from the Airport starting at 6 AM daily. Enjoy your stay with us in the historic Federal Building, just minutes from Creighton University. Large, permanent conference table in the center of the room. 286 square feet, 22 feet by 13 feet. All meeting room rental fees and food and beverage charges are subject to a 20% Service Charge and 7% tax. Atmosphere/Decor: Large windows offer natural light to the entire board room. Light cancelling blinds are able to be used during presentations. Atmosphere/Decor: Large windows offer natural light for the entire meeting space. Light cancelling blinds are able to be used during any presentation. Atmosphere/Decor: Large windows offer natural light for the whole space. Light cancelling blinds are available to block out light for presentations. Special Features: We are a historical building and all of our meeting spaces have 12' ceilings and built in, complimentary, A/V equipment.